Written by TCKC	in Featured, News, Uncategorized. 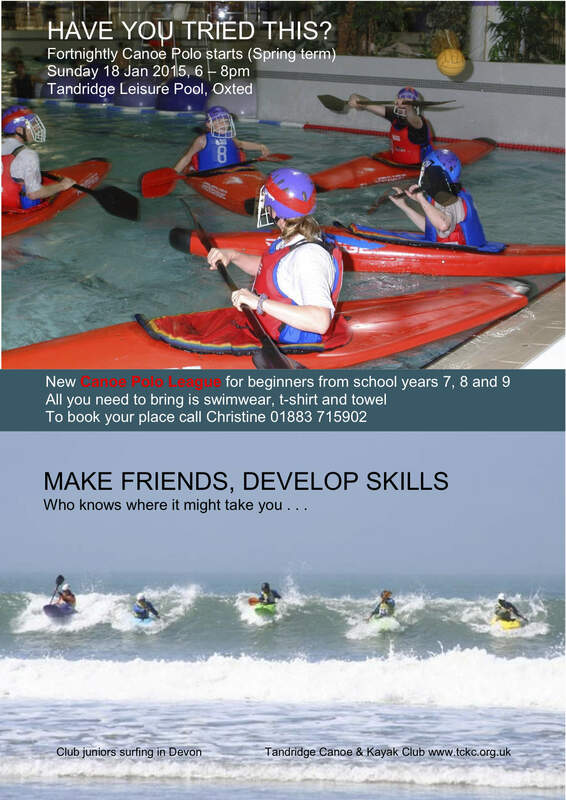 A new introductory Canoe Polo League is starting up fortnightly at Tandridge Leisure Pool, Oxted in the Spring Term and is for complete beginners from school years 7, 8 or 9. We’re inviting teams from schools, youth groups and groups of friends who want to try something new in a very encouraging, friendly environment where there’s a bit of fun competition thrown in. As this is a new group starting up, everyone will be at a similar level ie little or no experience of ever sitting in a kayak, let alone of playing canoe polo. For a team they need 4 or 5 players (all the same age or mixed ages) plus an adult . . .the adult is welcome to have a go too. All equipment is provided, players just need to bring along swimwear, a t-shirt and towel. Tags: Beginners league, canoe polo, Tandridge.